I grew up in a household where country radio was a staple of our car rides. And I certainly remember Juice Newton’s version of “Queen of Hearts” as a song that got quite a bit of airplay. 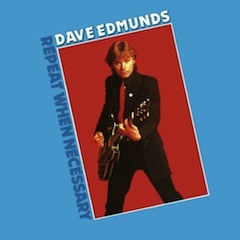 Enough so that, years later, when combing through the vinyl archives of my college radio station, I did a bit of a double take when I picked up Dave Edmunds’ Repeat When Necessary. Here was an even earlier version of “Queen of Hearts” that sounded, honestly, really similar to Newton’s slicker, pop-country rendition. Dave Edmunds is an artist whose name ought to be more well known, but whose slavish devotion to 50s and 60s rock and roll undoubtedly pigeonholed him in the ears of listeners. He cranked out a string of UK hits in the 70s and 80s with the band Rockpile, his collaboration with songwriter Nick Lowe, and Edmunds’ 1979 album, Repeat When Necessary, was recorded simultaneously with Lowe’s Labour of Lust, both with Rockpile as the band. Great tune. I had no idea that Dave E played this before Juice. Thanks for sharing the story. Great choice! Typically, I was just streaming this album on the Rdio site yesterday, after taking a listen to the great expanded Rockpile re-release. That one sounds better than ever, and an Edmunds-Lowe acoustic Everly set seals the deal. Great to see mention of one of the pub rock greats. Daves version of Queen of hearts did make it to #11 in the UK. Sadly, I Hear You Knocking (1970) and Slipping Away (1980) were his only US hits. Dave Edmunds has always been one of my favorite real rock ‘n rollers, I loved his “slavish devotion to 50s and 60s rock and roll”. As a songwriter and musician, only Nick Lowe and Bruce Springsteen come close in this category. I would agree with Third Axis about the Love Sculpture albums. At the time I thought Edmunds played faster solos than any guitar player I had ever heard. I would also recommend his first solo album, “Rockpile,” from 1972, which included his minor hit “I Hear You Knocking,” as well as Neil Young’s “Dance, Dance Dance,” and a great song called “Down Down Down.” I always thought that, based on that album, Edmunds should have been Mick Taylor’s replacement in the Stones.